UV photoresist curing systems Unihard | USHIO INC. This ultraviolet irradiation device is used for photoresist curing in LSI manufacturing lines. 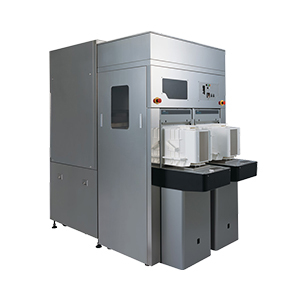 Equipped with a super high-pressure UV lamp and an excimer lamp, this system is used for various applications such as enhancing plasma resistance during dry etching, photoresist outgassing and burn prevention during ion implantation, neutralizing electrical charge, removing stress and low-k curing. Using a positive resist, this system has been adopted in semiconductor manufacturing lines, with over 700 units delivered. Applying UV irradiation to finish developing the positive resist causes a polymerization (cross-linking) reaction. The heat-resistance limit of the resist is thereby improved, increasing the heat resistance of various processes. Utilizing this characteristic contributes to improved yields and productivity. Guaranteed initial illuminance is 650 mW/cm2 (at 220 to 320 nm) with ±10% uniformity. System downtime is reduced because no adjustment is required when replacing the lamp unit. Supports all work cassettes including 6-inch systems (5-inch or less also available), 8-inch systems (6-inch or less also available), and 12-inch dedicated systems. An 8-inch system with an excimer lamp is also available. After processing by UV hardening, resist does not dissolve even after exposure to 250 degrees C for 5 minutes. Without UV hardening, resist dissolves after exposure to 150 degrees C for 5 minutes. H120 series 12-inch special-purpose equipment Equipped with SEMI-compliant load port to adopt EFEM. GEM300 compliant.